Hi friends! I hope you are having a great day! I'm feeling bad again today. It's so hard, I'll have a great day then the next day I'll just feel horrible. Maybe I'm still doing too much on my good days. Today, I have a blog post on the Love My Tapes Blog. 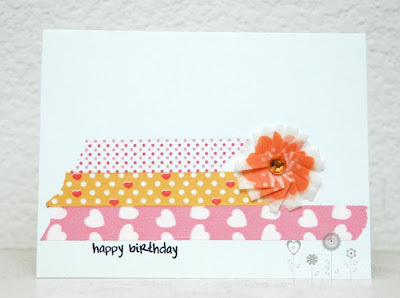 This is very similar to the cards we were making as a make and take at our CHA booth in January. I had to come up with a make and take on the spot and this is what I came up with. Sweet, simple, and fun! All the people who dropped by the booth really seemed to enjoy it. I used 4 different designs of washi tape. The washi tape is currently in the process of being added to the Love My Tapes site. The sentiment is from My Thoughts Exactly Stamps Under the Sea set. Please leave a comment if you'd like me to do a video tutorial of this washi tape flower. If people are interested in the video, I'll make it. This is so adorable Ashley! I am I love with the washi tape, that flower is too cool!